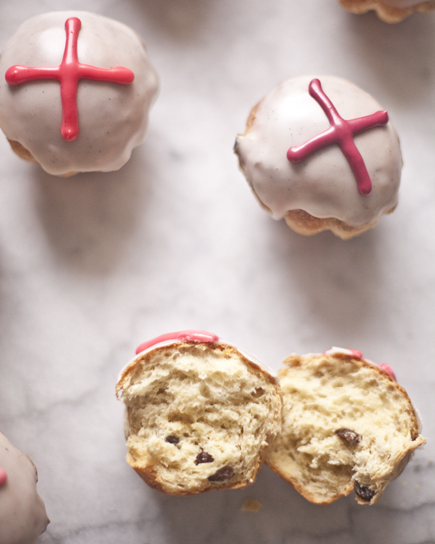 These classic Easter buns are made of a sweet dough that is spiced, studded with dried (sometimes candied) fruit and decorated with a cross made of icing. Adding a bit of color to the icing and baking them in fluted brioche pans adds a bit of flair, but you can make them free form by baking them on a lined baking sheet or in greased muffin tins. 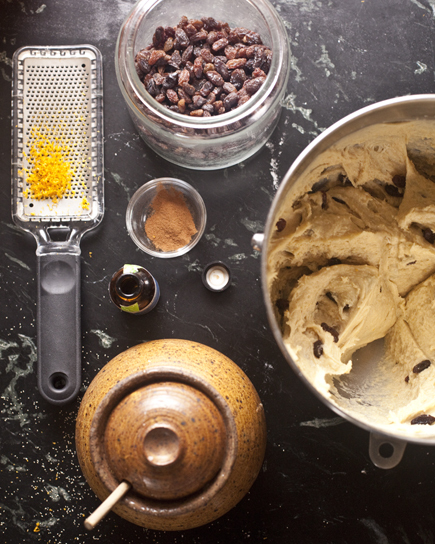 In a bowl whisk together the flour, cinnamon, nutmeg and allspice. Mix yeast, salt, eggs, honey, melted butter, zest and vanilla with water in a 5-quart lidded (not airtight) container. 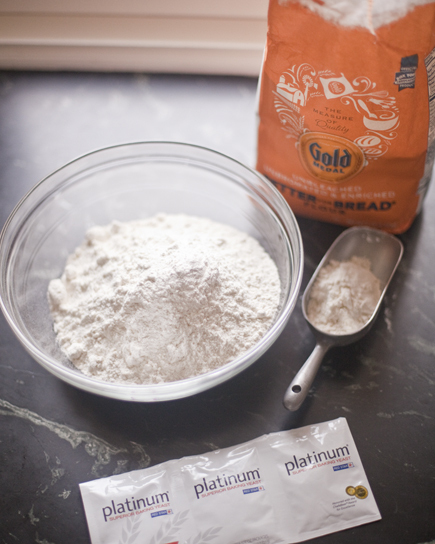 Mix in flour without kneading, using a spoon or a heavy-duty stand mixer (with paddle). The dough will be quite loose but will firm up when chilled (don’t try to use it without chilling). You may notice lumps in the dough but they will disappear in your finished products. Cover (not airtight), and allow to rest at room temperature for 2 hours. 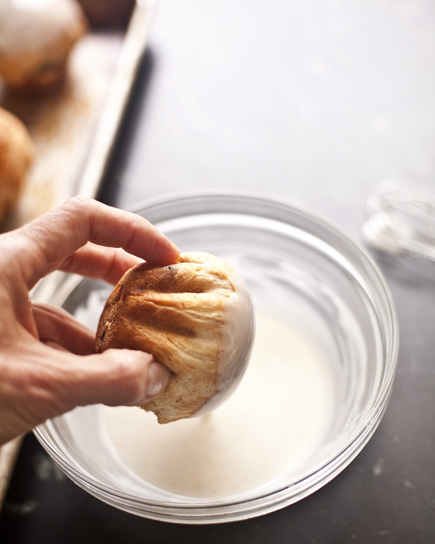 The dough can be used as soon as it’s chilled after the initial rise. Refrigerate in a lidded (not airtight) container and use over the next 5 days. 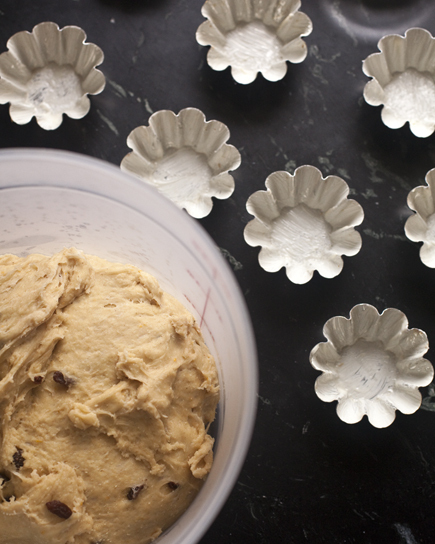 Beyond 5 days the dough can be frozen in 1-pound portions for up to 3 weeks. 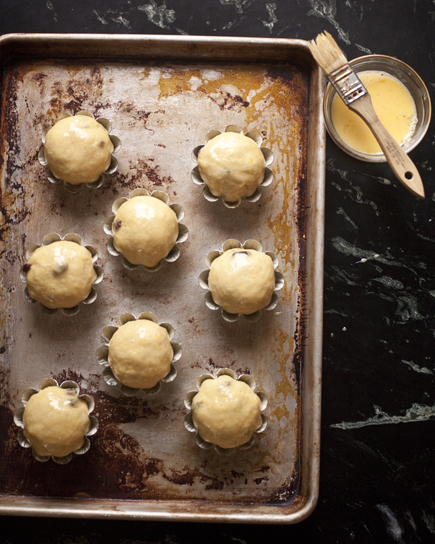 On baking day, Prepare as many Mini Brioche or muffin tins as you want to bake with butter. Dust the surface of the refrigerated dough with flour and cut off plum-sized pieces (about 3 ounces). 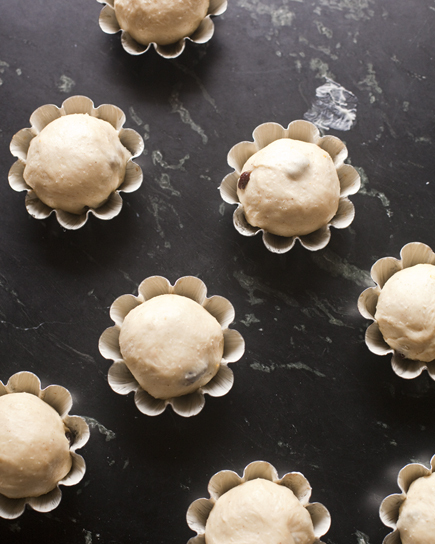 Dust with more flour and quickly shape the pieces into balls by stretching the surface of the dough to the bottom. This should take no more than 30 seconds. 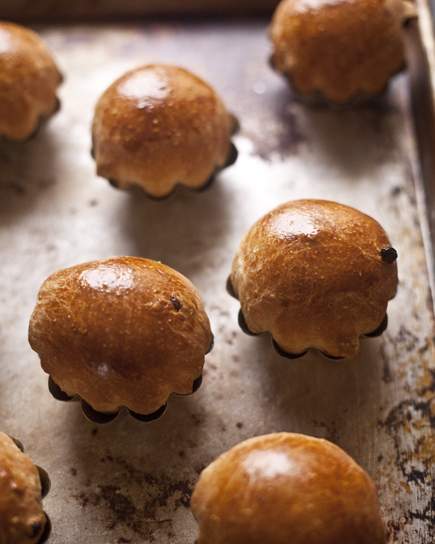 Place the ball into the prepared brioche tin, muffin tin or on a baking sheet. Allow to rest for about 40 minutes. Preheat the oven to 350°F with the rack in the middle of the oven. Using a pastry brush, paint the loaf’s top crust with egg wash.
Bake for approximately 25-30 minutes, or until caramel brown. 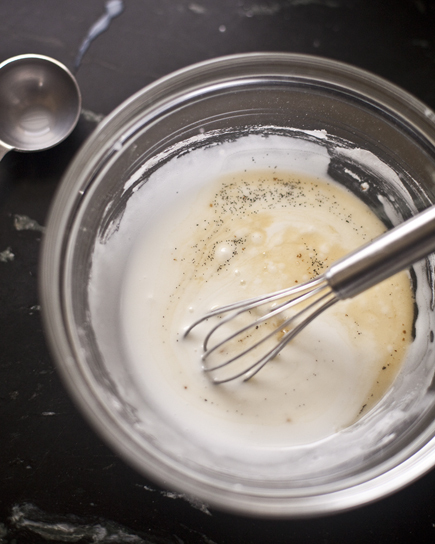 Whisk together the powdered sugar, heavy cream and vanilla extract. 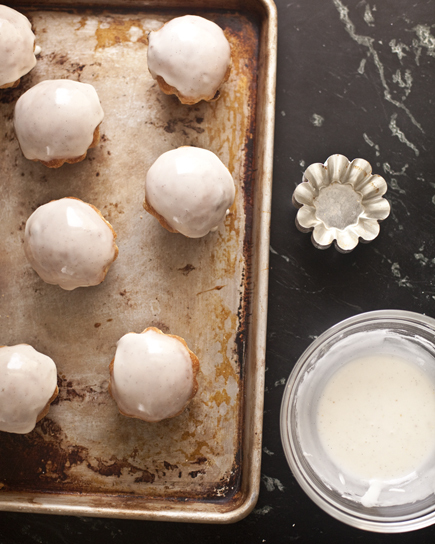 Dip the cooled buns in the icing and let the excess drip off. 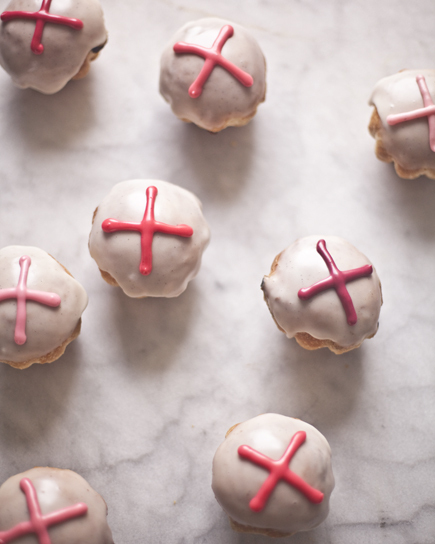 Allow the icing to dry for about 30 minutes before decorating with the cross. 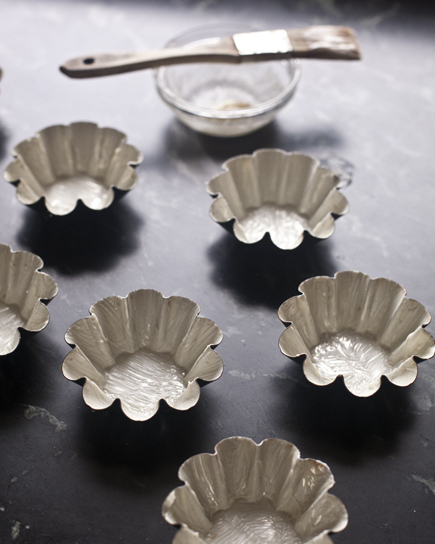 Add more powdered sugar to the icing, until it is thick enough to pipe from a pastry bag. Add food coloring at this point if you want a colored cross. 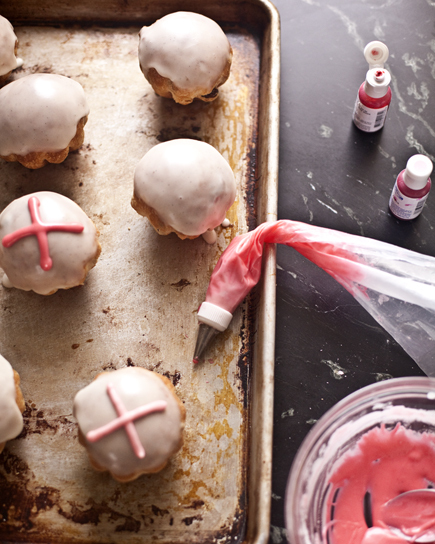 Pipe the cross on the buns using a small round tip. Enjoy! Check out the beautiful Sprinkle Easter Bread made with our dough that Sarah created for Handmade Charlotte.